The National Association of Distinguished Counsel employs an objective, rigorous, multi-stage selection process. The result is the identification of the finest lawyers in the country, named "Nation's Top Attorneys." Candidates are identified either by nomination or an in house research team. 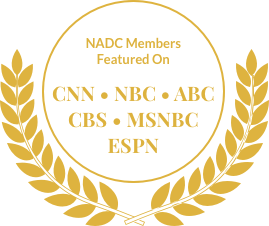 Nominations are accepted from members of NADC, fellow attorneys, and current or former clients. Once prospective candidates are identified, a lengthy vetting process is employed by NADC researchers. The information considered in this review process is sourced from publicly available information, including attorneys’ websites, public profiles, client reviews, and case results. Specifically, the research team evaluates factors which include, but are not limited to the following: firm profile and reputation, years of practice, education, training, trial experience, case outcomes, peer endorsements, client reviews, professional awards, professional memberships, leadership in legal organizations, community involvement, disciplinary status, and other noteworthy achievements. Multiple factors are considered by the NADC research team in evaluating its potential members. A blue ribbon panel of attorneys studies the results provided by the NADC research team. These attorneys, having achieved podium status in their own right by multiple independent organizations, separate and apart from the NADC, are specially positioned with the perspective and knowledge in selecting “Nation’s Top Attorneys.” While considering the information presented to them, they make careful determinations as to who among their peers possesses the background, accomplishments, and prowess to serve as an example to other attorneys. The result is a list of attorneys who are considered truly elite. A judicial review board, led by a group of former judges, weighs in on the final candidates. The purpose of this phase is to ensure that those who are named “Nation’s Top Attorneys” have epitomized the ideals of the legal profession. They finalize the process of selecting the attorneys whose stellar reputation and exceptional performance exemplify only the highest standards. Those invited as members of the NADC must exhibit qualities becoming of an Officer of the Court, and have also demonstrated admirable character and virtue in the course of their practice of law.